The Sony Xperia Z has a pretty standard set of functional elements above its screen. The earpiece is flanked by the front-facing camera on one side, and the ambient light and proximity sensors alongside the LED status light on the other. Since the Xperia Z relies on virtual navigation buttons rather than hardware ones, the microphone is all you get at the bottom. While the mic does reside under a grill identical to that of the earpiece, the smartphone doesn't have front-mounted stereo-speakers. Instead, the sole loudspeaker is mounted near the bottom edge of the Xperia Z's right side. It's joined by the volume rocker and the smartphone's signature power/lock key, as well as the microSIM card slot. The SIM slot is hidden under one of the plastic flaps we mentioned above. Sadly, there's no dedicated camera key here - that's a privilege reserved for the Xperia ZL. On top you get another plastic lid with the 3.5mm audio jack hiding underneath. While the cover prevents dust and dirt accumulation (in addition of keeping water out), it does have a somewhat negative effect on its accessibility. The bottom of the smartphone is completely bereft of functional elements. Finally, turning our eyes to the back we spot the 13 megapixel camera lens, the LED flash and the secondary microphone. The primary use of this microphone is noise cancelling, but it also enables the Sony Xperia Z to capture video with stereo sound. Underneath the back cover sits a 2330 mAh battery that should keep the new Sony flagship going for up to 14 hours of talk-time or 530 hours of stand-by. Those are some impressive numbers, but we'll have to complete our battery testing routine to know how the real-life performance stacks up. Here's hoping it performs as advertised as the battery is non-removable, and to extend the Xperia Z's power autonomy you'd have to either carry one of those awkward portable chargers or slip on a juice case and ruin both its slick looks and slim waistline. We come to the main event of the hardware show. The Sony Xperia Z 5" 1080p display is definitely its strongest selling point and with a pixel density of 441ppi you can see what all the fuss is about. We have already mentioned this a few times, but let's go over it once again just in case. You can actually see the sharpness advantage over the 720p displays of the 2012 flagships with a naked eye. However, the difference is by no means as big as when smartphones departed the WVGA screens and started passing the Retina barrier. 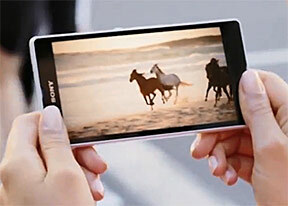 The Sony Xperia Z also comes with the second version of the company's Mobile Bravia Engine, which should improve its performance for video playback and image browsing. Thanks to that and the immense resolution, the Xperia Z has easily the best smartphone display the Japanase have produced so far. It is also the least reflective so far, which helps it perform much bettter in bright sunlight. However, the screen is by no means perfect. First of all its viewing angles aren't really great. They are a step forward compared to the Xperia T, but a very minor one. In that area Sony still has a lot of work before it catches up with the competition. More disturbingly, the display has rather poor contrast for a flagship unit and not really inspiring colors. As testified by the measurements in our dedicated test it comes nowhere near the standard of its main competitors and it even fared worse than its predecessor. We've asked Sony to send us another unit so we can double check if this is not some sort of unit-specific issue we are experiencing here. So we'll be able to repeat the test next week and we'll make sure to update you if the results come up different.